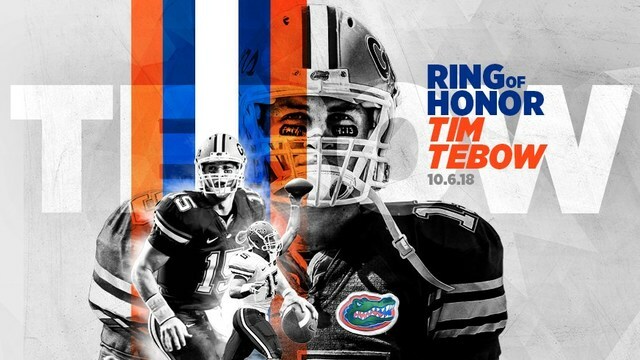 Gators football star Tim Tebow will be inducted into the University of Florida Football's Ring of Honor this fall. The university made the announcement Wednesday. Tebow, a two-time National Champion and 2007 Heisman Trophy winner will be honored during the Florida vs. LSU game in Gainesville on October 6th. His name will be unveiled and displayed in the North end zone of Ben Hill Griffin Stadium. Tebow joins Wilber Marshall, Emmitt Smith, Steve Spurrier, Danny Wuerffel and Jack Youngblood in the elite Gators Ring of Honor. "I am so humbled and thankful to be able to receive this blessing, being inducted into the Ring of Honor," Tebow said. "I know in my heart that I truly couldn't have done it without amazing coaches and teammates who loved and sacrificed for each other so that we could accomplish our goals. Loving Florida wasn't just something I did for four years, but it has been a lifelong passion. I want to thank the University of Florida and all the fans for making Gator Nation so special. I was born a Gator, I played as a Gator, and I'll always be a Gator! God Bless and Go Gators!" Learn more about Tim Tebow here .